Your wedding is one of the most important days of your life… that goes without saying. We recognize this, and when you work with Emperor Limousine to handle transportation for your wedding, you’ll get a limousine or party bus that you love… and of course, the impeccable service that you need to make sure everything runs smoothly. We treat your wedding like our own. Our fleet ranges from brand new to just a few years old. And we own all of our limousines. This is very rare in the limousine industry – as you can imagine, new limousines are quite expensive, so many limo companies try to cut corners by using older vehicles or renting newer ones. We don’t do that. Others will also “outsource” your wedding to another company – this almost always results in a subpar experience for you. We never, ever do that. When you work with Emperor Limousine, you get our fleet, our staff, our everything. And we hold ourselves to the highest standards possible. It starts with our vehicles. You can rent a party bus or limousine for your wedding – whichever one you choose, we guarantee that it will look flawless. No broken parts, ripped upholstery, or anything of that nature. In fact, it’ll look like it just came out of the factory. The vehicles themselves are nothing short of extraordinary. We’ll always have a multitude of limousines or party buses for you to choose from, no matter when you’re getting married. They come with elite sound systems, amazing light shows, large LCD TVs, exquisite leather seating, and on our party buses, the floor has a sleek porcelain tile finish. You can feel free to drop by any time Monday through Saturday to see our fleet. We’re based in Addison, but we service all of the greater Chicago area. Just call us to schedule a viewing. One more thing – we also stock our limos for you. This includes water, ice, soda, beer, and even champagne. All beverages are ice-cold, pure, and fresh. They complement the luxury experience so that you have the best ride possible. Wedding party buses or limos – call to learn more! They’re also thoroughly briefed on your wedding from A to Z. They’ll know exactly what’s happening, when. You have a picture in your head of how the big day will go – our chauffeurs will make sure that the picture becomes real. No hiccups, no mistakes. Just professionals. All limo companies claim to give you a “flawless experience”, but many fall short on that promise. We don’t, and here’s how. We have both backup vehicles and drivers. We guarantee that you’ll get the exact limousine or party bus that you order, but things do happen – in case something unusual happens and your vehicle is unavailable on the day of, we have multiple replacements (of equal or higher quality) ready to go. We also have backup chauffeurs (who are briefed on your wedding, too) just in case the scheduled one gets sick. Again, neither of these things happen frequently, but it’s always good to have a backup, especially on such an important day. On top of that, we’re organized – you’ll get a detailed email with all of the specifics shortly after booking, and we’ll call you twice on the week of the wedding to verbally confirm that everything is all set to go. The point we’re trying to make is that we take your wedding as seriously as you do. That’s why we’re one of the most popular limo companies in Chicago for weddings. You get the best limo or party bus, the best service… and the cheapest price. You’re probably already spending quite a bit on your wedding – we don’t want to add to that cost with exorbitant rental costs. Quite the opposite, actually… our entire fleet is priced very competitively, and if you come to us with a lower quote from another company, we’ll do our very best to beat their price and win you over. Call (630) 383-4200 to speak with a booking agent! On-Time Guarantee for all of our wedding packages! If we are late more than fifteen minutes for whatever reason, your wedding package will be completely FREE! Please take a look at recent photos of our wedding customers below. Take a look at a couple of recent wedding limousine service videos in Chicago. 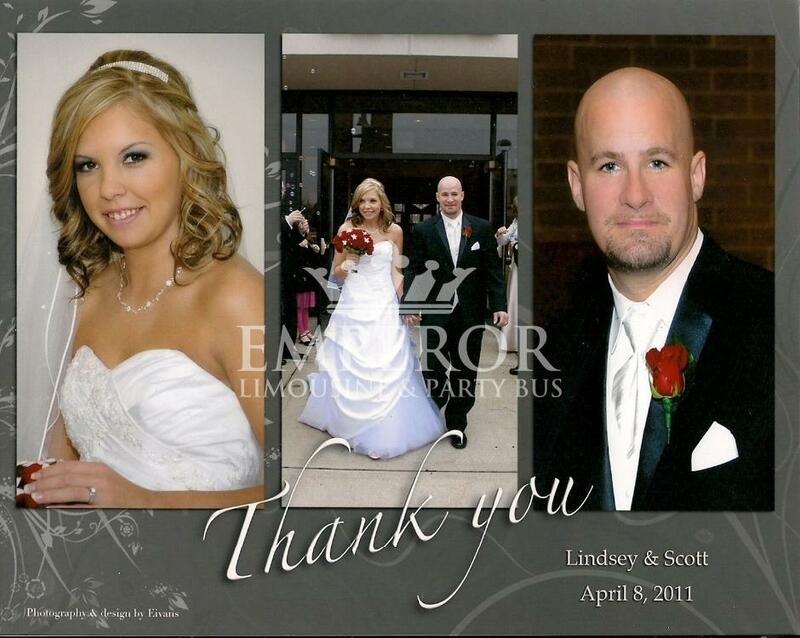 We would like to thank all of our brides and grooms for recently using us as their wedding limousine service provider!